Palms Presbyterian Church is a community church located in Jacksonville Beach, Florida. They had a website, which was difficult to update, not mobile friendly, was unable to quickly and easily deliver audible or video sermons, church services and events, local community happenings, as well as offer an easy way for people to make charitable donations. The church wanted to redesign the website to attract more parishioners, make it easy for visitors to find out the local happenings, sign up for events, and to make it easy for current members to find the information they are looking for. 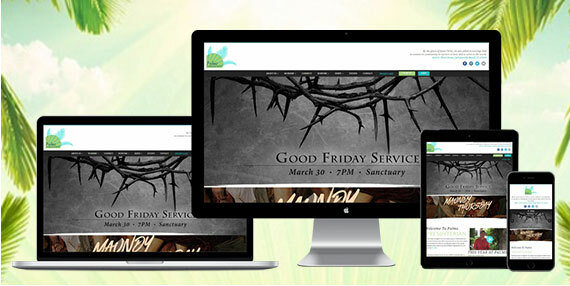 We recommended the development of a completely new website, built from the ground up, with a custom design based on their current branding campaign (no templates) to convey the message of the church to the local beach community. Our goal was to educate the community about what Palms Presbyterian Church has to offer, to provide greater exposure to the community by integrating social media and offer an easy view of upcoming events and worship services. We also wanted to facilitate the addition of new content to improve organic site rankings and make the entire site mobile friendly.